← February Challenge – bad boy, bad boy! The sound clip comes from the song “Rich” by the Yeah Yeah Yeahs. Please click the image or text link below to be taken to the Flash banner. One of the ideas for this banner comes from RavenRoseBeetle who commented on a Graphic a Day in May blogpost. Thank you RavenRoseBeetle! Also in those same comments, Lizzie explains how the “levitating” effect in this photoshoot was accomplished. The banner plays rather choppily but I didn’t have time to fix it. I think it’s because the file is too big so I’ll remember for next time. The effect is kind of cool though. I am planning on a second project based on your patterns submissions and I’ll be soliciting more pictures in the next few days. See you soon! P.S. If you’re so inclined, the eBay charity auction for the Richard Armitage quilt ends soon: http://www.ebay.co.uk/itm/Richard-Armitage-Patchwork-Quilt-Original-Unique-/130646609764. Proceeds benefit Project Linus which is a very worthy cause and I have personal experience with them from a previous job working with homeless children. This entry was posted in Flash, Graphics, richard armitage and tagged actor, flash, flash animation, flash banner, richard armitage, richardarmitagenet, richardarmitagenet.com, richardarmitagenetdotcom. Bookmark the permalink. @April: Welcome back from your trip! Thanks for your lovely comment! You’re first again today, woohoo! @wisemar: *giggle* I get overly excited every day working with Richard Armitage graphics. 😀 Good point about the full-body shot. Oooh I’d love to have a class with RA as teacher. Once I had another weird dream that RA was a professor of spices, LOL! We had to identify them by smell for our exam. WordPress logged my comment under my old worldpress account! Garr! But it’s me! It’s me! lol Professor of spices, hmmm? What would RA’s spice be…something a little subtle, a little sweet, but not too overpowering…I’m going with nutmeg! 🙂 RA = nutmeg! Hahaha! @Margie: I recognized you. 😀 LOL re: nutmeg! @cdoart: Delighted you enjoyed this effect, thanks! This is way cool and perfect for this picture! 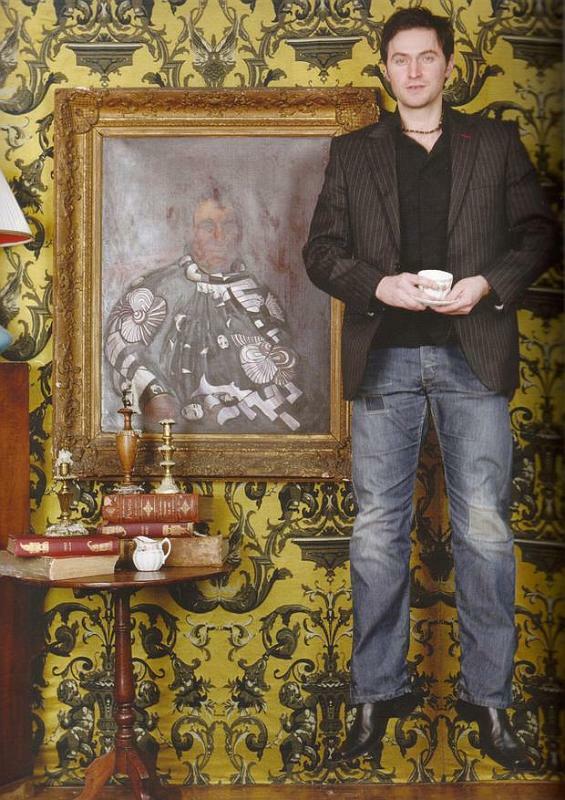 I love how everything, including RA is floating all around the room! @jasrangoon: I can’t begin to explain how much fun this animation was to put together. I’m going to try this again sometime with a smaller animation so it’ll be smoother, but it’s all part of the learning process. Thanks for your lovely comment! LOL, this is awesome, B! It’s magic! Very clever, can’t help but watch it over and over. Thanks for sharing the fun. Since RA is a work of art he does belong in a Chagall painting 🙂 Just love the effects on this one. A little of Dorian Grey and a little of Houdini. And the detail of the smoke on the cup , welldone! The pic is wonderful , good choice jazzbaby1! Oh that’s really magic banner. I love it! BTW, I feel that only RA can fly with hot tea or coffee in hands 😉 LOL! @Ania: LOL, yes he is remarkable in every way! 😀 Thanks for your funny comment! That steam is coming from the cup, right? We might have to investigate further, beengizzied! I think we could be like Lewis and Clark or Burke and Wills and EXPLORE until we found the source. @jazzbaby1 & @beengizzied: You two are cracking me up. You make a great comedy team! Which of you is Guy and which is the sheriff? Isn’t ambiguity a great thing? @IngeD3: I’m really lucky. 😛 Thanks for your comment! @Ana Cristina: Oh bummer that you don’t remember your dreams. I have always been a vivid dreamer so it must be genetic. LOL re: Houdini and Monty Python! Thanks for your kind words and I’m looking forward to the next challenge and FanstRAvaganza! Thanks for your lovely comment! Good things happen when one rubs me the right way ;D) Love Floating Richard! HaHa, love this! I couldn’t help laughing and glancing up at one of my wall posters and wondering what I would do if he came floating at me! Sorry the 14 day challenge is over already. It’s been fun! Bccmee, you are so CLEVER! That was truly amazing, great work. The14 days is over already? Nooooooooooo! Thanks jazzbaby1 too. Hi Bccmee. Did you manipulate the photoshoot to include that Marc Chagall painting? I can’t remember it being in that photoshoot but it is a long time since I’ve looked at those photos. Great banner once again – thank you. Ah, the banner is finally playing all the way through so I see the painting changing! Every time I see a Marc Chagall painting, I want to go back to Nice…..and Cannes……and Monte Carlo…..and Grasse ……and Cagnes Sur Mer…..and …well, you get the picture! @kathryngaul: Thanks for your patience with the banner. It’s a bit slow and choppy in the playback so next time I’ll remember to make my files smaller. It would be very time-consuming to fix this one because it has over 20 layers which would need to be adjusted. Thanks so much for your comments! Yes, I love the south of France too! Oh, sorry…I hope you didn’t think I was complaining about the banner – I love it!. It’s just that my computer was on a bit of a go-slow earlier on because I was running too many things at the same time! Thanks for another wonderful gif, Bccmee! Would that RA would float my way. Sighhh! I’ll have to get my heartthrob net handy so that I can catch him as he floats by. In my dreams, of course. Giggles! Your animations are so cool! Reminds me a bit of the Monty Python bits between skits! 😉 I was going to ask about the painting but KathrynGaul mentioned it as being a Chagall? I am curious — Did you choose that painting for any special reason? I was always intrigued with that photo and you have made it even more interesting! Thanks! Loved the details, too….down to the steam off his tea! Great banner, Bccmee! And great pic choice, Jazzbaby! It’s been a wonderful February, and I’m looking forward to what gems you come up with for us in the future…..Thank You, Bccmee!!!! @Debra: Oh you’re so sweet to take the time to comment! Thanks very much. 🙂 I’m delighted you noticed those details. This was a lot of fun to put together. Oooo, so many details going on in this one..pages flipping, steaming coffee, Richard and his BRIDE!???? Whoa…the painting changed! You are just too cool for words, B!! Brilliant!! Loved the effect so much! Oh it works now! Many things happening in this clip. Things floating through the air, another painting appearing! Very cool done. Whats the other painting, B? I wonder how they made RA float? Although I’ve seen in a docu how they can manipulate a pic, specially how they do it in Glossy’s!